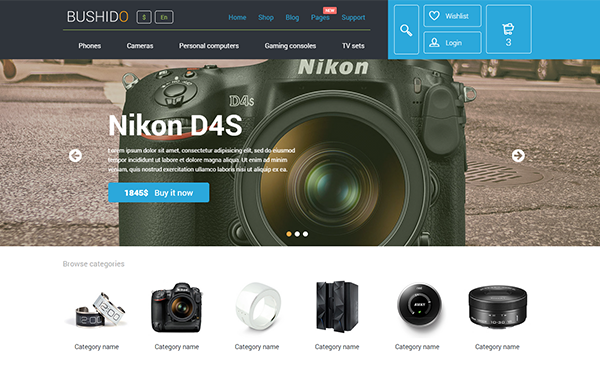 Bushido is highly customizable and technological HTML5 e-commerce template for real tech geeks. Lots of components, widgets and pre-built page variations along with great premium slider makes it perfect solution for those who want to run online retail business. 31 fully functional pages. 100+ variations of online-stores that you can develop with minimum effort. We used LESS pre-processor during development which greatly simplifies the ongoing tuning and customizations of a theme according to your needs. 5 types of Home pages including premium Landing page to effectively promote your products. Thanks to our marketing team the template contains a lot of features helping to effectively merchandise. One of them is a fixed menu. You gain more space for your content - everything you need is restructured into a small navigation bar. To help the users to concentrate on the content we use strict and calming coloursas a marketing trick. The search bar should be definitely mentioned - it is reasonably compact in our implementation but at the same time is observable. On click it expands into a fully functional form which can be easily filled on any device. We haven't forgotten about Coming Soon page. Are you on the way to open the store and you already keep intrigue in social networks to make your potential customers subscribe for an opening event? We have already done it for you! It is worth mentioning one substantial detail: the absence of the horizontal scrollbar on different devices including desktop versions. The template includes the premium Master Slider. You save 15$ on a theme purchase. Yeah, it's not a joke. The rest is for nothing. We are constantly improving our product - you will be offered free updates once you purchase it. * Images are taken from press kits for demo purpose and not included in download. All rights belong to their respective owners. jQuery v1.10.2 - most popular feature-rich jаvascript library. jQuery Easing v1.3 - add-on for jQuery to create nice easing effects. Modernizr - jаvascript library that detects HTML5 and CSS3 features in the user’s browser. Respong.js - script enables responsive web designs in browsers that don't support CSS3 Media Queries - in particular, Internet Explorer 8. TouchSwipe - Plugin that enables touch/swipe functionality on mobile devices. Master Slider - Responsive Premium Touch Swipe Slider. OWL Carousel - Responsive touch enabled jQuery carousel slider. Shuffle - jQuery plugin for categorizing, sorting, and filtering a responsive grid of items. jQuery lightGallery - lightweight jQuery lightbox gallery for displaying image and video. Stellar.js - jQuery plugin for creating Parallax effect. iCheck - Customized Checkboxes and Radio Buttons for jQuery. The Final Countdown - A simple and html agnostic date countdown plugin for jQuery. jQuery Validate - Clientside Form Validation Plugin. Dear visitor, you came to the site as an unregistered user. We recommend you Register or enter the site under your own name.